For the 5th consecutive year, the 2nd Primary School of Acharnes remains faithful to its appointment and makes the last Saturday of May the most beautiful celebration! 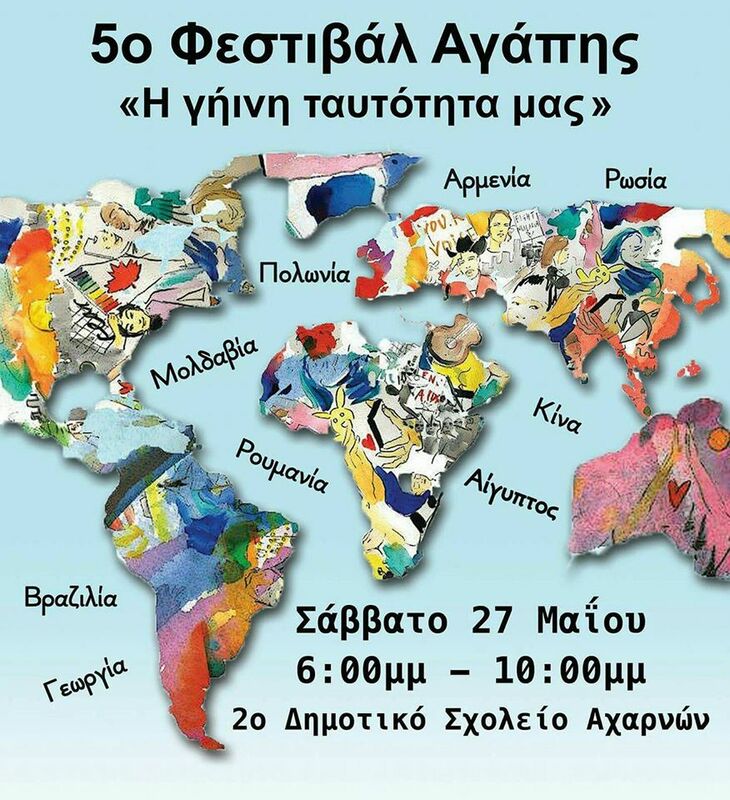 The 5th Festival of Love & Acceptance is set on May 27 from 18:00 to 20:00 and this year borrows the title “Our Earthy Identity” from the book published by UNESCO entitled ” Seven Complex Lessons in Education for the Future”, by Edgar Morin. Morin, as Research Director at the French National Science Research Center, contributed to the international dialogue (1996) on the principles of an education for sustainable development, with the aim of reforming students’ thinking in a complex, multicentric way, fed by their cultures of the world. Later, at the United Nations Summit in New York (2015), one of the 17 development goals addressed to all countries is related to peaceful and inclusive societies. Education for Global Citizenship is one of the strategic areas of the UNESCO Education Program for 2014-2021, which together with the Sustainable Development Education are recognized as mutually reinforcing approaches to the promotion of Human Rights and Peace on our planet. With the aim of peace and the goal of educating the students to become Citizens of the World, the 2nd Elementary School of Acharnes invited 10 countries of the world (Georgia, Moldova, Poland, Romania, Russia, Armenia, China, Egypt, Nigeria and Brazil) from The 4 continents (Europe, Asia, Africa and the Americas), a total of 200 people, to present their Intangible Cultural Heritage (music, singing, dancing and arts) through cultural associations nominated by their embassies. Besides, according to the Convention for the Protection of the Intangible Cultural Heritage, “Its importance is a driving force of cultural diversity and a guarantee of sustainable development”. Generation 2.0 RED once again actively participates and is delighted to support this event by inviting you to attend one of the most beautiful events in the city. The event ends with a parade on the streets around the school, with Graduado Tucano Abadá – capoeira and BATALA ATENAS with their drums, representing Brazil.